This section covers creating, modifying and removing reseller packages. 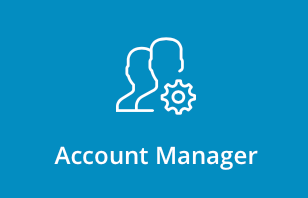 To access reseller packages, sign into the control panel and then click on the "Account Manager" icon, followed by the "Manage Reseller Packages" link. If your Admin account is newly created, you will notice that there are no Reseller packages created yet. It is important to create at least one package now because Reseller accounts need a package assigned to them. Click the "Create" button at the top of the page. Select your desired features, enter a name for your package and click the "Create" button. Note: Spaces are not permitted in the Package Name. Bandwidth is defined as the total data transfer of all the Reseller's Users + the Reseller's own web site. Bandwidth is measured in megabytes, so 5000 megabytes equals approximately 5 gigabytes of transfer. When a Reseller exceeds his/her bandwidth, their site is suspended until the first day of the next month. This is the total storage space for the account, in megabytes. The disk space is shared between a Reseller and all his/her Users. When Resellers reach their disk space limit, they are not permitted to upload more files until others are deleted. Each file and folder under a Reseller and all his User(s) account(s) is an inode. Having a limit on inodes in DirectAdmin prevents a runaway User from having too many of them. This is the number of actual domains a Reseller is permitted to host. As an Admin, you may set this feature to "Unlimited" and let the Reseller work within his/her disk space and bandwidth limits. Please note that the number domains is not equal to the number of Users, because Users can have several domains on one account. This is the total number of subdomains a Reseller is permitted to host. Please note that a single User can have many subdomains, so it is best to set this to a high number or to "Unlimited." This is the number of POP3 mail accounts a Reseller is allowed to provide. This is the number of forwarding addresses a Reseller is allowed to provide. This is the number of Majordomo mailing lists a Reseller is allowed to provide. This is the number of autoresponder accounts a Reseller is allowed to provide. This is the number of MySQL databases a Reseller is allowed to provide. MySQL databases count towards total disk space usage. This is the number of domain pointers a Reseller is allowed to provide. This is the number of FTP accounts a Reseller is allowed to provide. Even if you set this number to 0, each User will still have a default FTP account with full access to their site. This is the total number of IP addresses allocated to a Reseller. Every other feature (e.g. personalized nameservers and a static/dedicated IP for the Reseller's web site) borrows from the number of addresses in this field. For example, if you scroll further down the package table you will see the "Personal DNS's" setting. If you pick the "Uses 3 IP's, domain gets own IP" option, the Reseller will get a static IP for his/her web site, and two additional IP addresses for name servers. However, this feature will not work if the number of IP address in the "IPs" field is less than three (3). You can, of course, allocate more IPs than needed to a Reseller so that Reseller can provide static/dedicate IPs to their customers. This permits Users (including Resellers) to allow anonymous logins to their FTP site(s). Users have the ability to disable anonymous upload while still allowing anonymous download. Anonymous FTP can present a risk to the User's site, and many Admins choose not to enable anonymous FTP access. This permits Resellers to allow Users to install Secure Socket Layer (SSL) certificates on their site. This permits Resellers to access the server through SSH (an encrypted form of Telnet). This permits Users created by Resellers to access the server through SSH (an encrypted form of Telnet). Many Resellers and Admins disable this feature due to the potential for abuse (Users have full access to server content). Enabling this feature means Resellers are able to provide SSH access to their Users. Some server Admins don't want resellers to sell more than they are actually allowed to, so this features allows admin to control overselling. This permits Users to alter their DNS records (e.g. A records, MX records, etc.). Many Resellers/Admins disable this feature because Users can disable their entire site by accidentally deleting or modifying domain records. None. No personalized name servers are created for the Reseller. 2 IP addresses (domain uses one of them). 3 IP addresses (domain gets own IP). Important: Please make sure the appropriate number of IP address is set in the "IPs" field (above). This feature allows Resellers to create name-based sites using the server's main IP address. 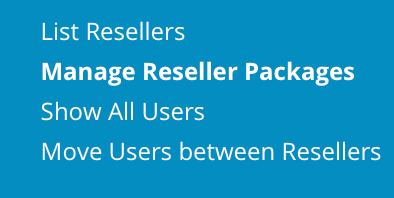 At the main Reseller Packages menu is a list of all created packages. To delete one or more packages, place a check next to the package name(s) and click the "Delete Selected" button. In the above example, the "GodMode" package would be deleted. Note: Deleting a package will not affect Resellers whose accounts are associated with that package. Their accounts will remain unchanged (with the same limits as before). However, the package name will no longer appear in their account information screen. To edit a package, click on the package name (first column of the table). When you are finished, click the "Modify" button.